Keeping fish alive in the wells during tournament situations or any time on the water is important. Rejuvenade makes it easy on you and the fish you are keeping in the well. 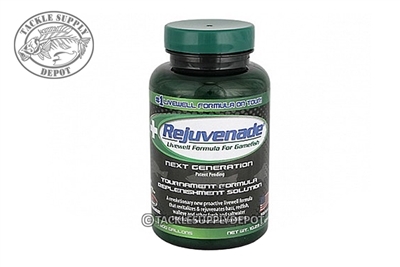 It revitalizes, replenishes and re-energizes bass and gamefish preparing them for release. By replacing lost energy and helping to return proper balance to the fish's system, it helps decrease recovery time and also helps to increase the survival rates of bass and gamefish caught and held during tournament angling. Contains only food grade dyes and human food and animal feed grade nutritional suppliments. One Cap per 20 gallons of Livewell water.